Several years ago (during the fall of 76) a small group of desperate and dry Christians gathered together at my sisters home. We knew Jesus, we knew the Word of God ... yet we were disconnected and lacked intimacy with the Lord. We gathered together Sunday nights after church to pray and sing songs, and gradually our singing of songs became worship as we connected with the heart of God. Its been twenty years since we first gathered, and God has been gracious, making His love known to us. This album is an outgrowth of that earliest time together. 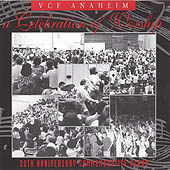 Its a recording of a Sunday evening worship service in 1981, recorded with two microphones on a reel to reel player. Its not the same recording quality that weve become used to, but I think youll find the quality of worship not to be lacking! Enjoy! Information on this page last updated 05/04/1999 All information provided on this page is copyright © 1996-2019 Valley Vineyard Christian Fellowship. If you spot any errors, inaccuracies or other bloopers, please send an e-mail to Donn Edwards at vmu...@spamcop.net. Do not use this email address for any marketing purposes.